Whether we are aware of it or not, we all carry a sense of place for ourselves and how/where we fit in to our workplace, professional networks of colleagues, and social circles. Most of us move through our careers making decisions big and small based on how we perceive that mental geography. For most of us, the traditional map is some variation of hierarchy, departmentalization, and areas of influence. I manage this project, those people; I am managed by her and I belong to that department; I provide service for them but have little influence over what they do and how they do it. As with all creations of our mind, the reality of that geography may have never reflected what could or should be, but hierarchy and silos made sense in a world of traditional leadership and departmentalization. That world is shifting digital sand under our feet. With the advent of digital communication and open networks, our ability to lead, follow, influence, and be influenced has never been more fluid. The anxiety that individuals and organizations feel over the last several years reflects the loss of the map that has served us, and with it our understanding of our place. 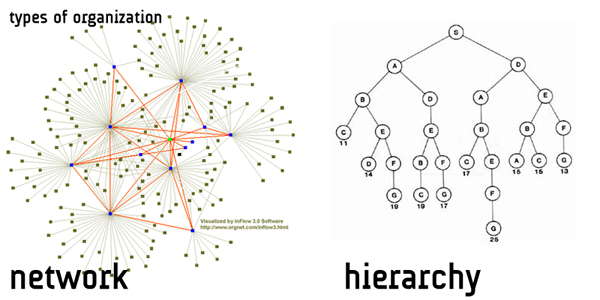 Each node can find each other, be it person, data, server; internal or external to an organization. We now live in a networked age. We are all increasingly interconnected with, by, and through each other and with information that ricochets around us at nearly imperceptible speeds. Hierarchy is giving way to wireachy. A new mental map forms, where people, data, and ideas are all vectors that connect or deflect in reaction to each other. The hierarchy that was so effective in amassing the troops and directing activities is giving way to something quite different. Our primary activity is to learn. Whatever our job is today will be different tomorrow. Those who cling to “this is how we do it here” will be increasingly isolated and frustrated. Those who become continuous learners and flexible actors will be in position to thrive. This new Learning Age perhaps requires not a map at all, but a compass. In a flat landscape without rivers to cross and mountains to climb, we need a direction in which to head and the agency and autonomy to find our own ways. Leaders will still set the necessary vectors and create a compass for all in an organization to follow, but individuals are free to explore, fail, succeed, and learn with shifting collaboration and cooperation as the moment warrants. Learning professionals have an essential role to play. While a small percentage of people are already setting their compass and navigating the network, most don’t have the mental geography or digital skills to learn, influence, and make sense of the new reality. Learning is not only essential, but so too is learning to learn—and relearn—the recursions of modern digital work. We need to step up and show people how navigate. Knowledge led people to change from reading the stars for fate to instead use them for navigation. Hmmm … nodes in the network resemble stars in the sky. Yes, recursion. ← “Technology” does not have a multitasking problem. Multitasking has a multitasking problem.